The first time I read about Almighty Voice was in an article in the British children's magazine World of Wonder, where it was accompanied by a beautiful, if highly romantic and not particularly accurate, panting by the great illustrator, Ronald Embleton. A few years later, the story was the basis of strange Canadian film, Alien Thunder, aka Dan Candy's Law (1974), starring Donald Sutherland. Almighty Voice (Shu-Kwe-weetam or Kay-kee-say-manitou-wayo, The Voice of the Spirit; also known as Jean-Baptiste) was a young Cree in One Arrow's Band at the Duck Lake agency, born near Batoche, Saskatchewan 1874. Band and family ties linked him to leaders who had opposed the conditions forced upon the Cree by the Canadian government: he was the son of John Batoche or Sounding Sky (See-nay-way-kee-sick), a Saulteaux from Nut Lake, who was a former freighter for the Hudson Bay Company, and his wife, Spotted Calf, the daughter of Koh-ah-mah-chee a Head Man at One Arrow and the brother in law of the chief of the Willow Crees, who had refused to settle on a reserve until 1879. Sounding Sky had been a prominent fighter with Riel's forces in the Rebellion of 1885 and One Arrow had spent three years in Stony Mountain prison for fighting alongside Gabriel Dumont’s Metis. As a young man, he had a reputation as a ladies man – he had married three times by 1895 and this had brought him into conflict with the farm instructor on the One Arrow Reserve, who was trying to enforce monogamy; he was also a successful hunter and a swift runner who was difficult to catch. On 22 October 1895, he was arrested by the Mounties for butchering a stray cow. Some sources say it was for a wedding feast; others suggest it was to feed his brother’s sick child. According to Dan Kennedy in his book, Recollections of an Assiniboin Chief, he slaughtered the cow to feed his brother's sick child, although he had first sought the permission of the agent and was turned down. There was no formal report submitted by the Indian agent R. S. McKenzie until November 8 and there is evidence to suggest that the NWMP command in Regina thought the information they had to act on was too vague. Almighty Voice was held at the police guardroom at Duck Lake and with him were another Indian man and a woman. By Kennedy's account, a police guard ‘jokingly’ told Almighty Voice that workmen putting up the framework of a building next door were "erecting a scaffold from which you will be hanged next morning." Taking the matter seriously, he escaped from the jail that night and made for his mother’s home on the reserve, swimming the ice-cold Saskatchewan River. On October 29, 1895, NWMP officer Sergeant Colin Colebrook caught up with him near Kinistino; although Almighty Voice warned him to keep away, he attempted to arrest him and was shot and killed. Over the next year, he was a wanted man with a reward of $500 on his head but it seems likely that he was supported by sympathetic Metis, Cree and Saulteaux, the Nut lake band having ‘no time’ foe white people. Central Saskatchewan was under constant vigilance by the NWMP until May 1897 when policemen visited the One Arrow reserve to investigate a cattle theft and saw a group of Indians on a nearby bluff. One officer went closer to investigate and was shot in the arm. The following day, arrived and saw three Indians hiding in the undergrowth on the side of a hill. Three officers went forward to investigate and two were wounded by gunfire and had to turn back. Efforts were made to set fire to the bluff but when that failed, the posse of 100 police and civilian vigilantes decided to rush the Indians with disastrous results: two Mounties, Corporal C.H.S. Hockin and Constable J.R. Kerr, and a civilian postmaster, Ernest Grundy, were killed and another man was wounded. During the night, the hill was surrounded to prevent the escape of the three men, Almighty Voice and his cousin, Little Saulteaux, also known as Standing in the Sky (Ah-much-away-his-a-quip), who was around 15 years old, and his brother-in-law, Too-pee-ann, also known as Joe Pierre or Dublin, who taunted the police, asking for supper because they were hungry after a hard day’s fighting. The next day police moved in seven and nine pound cannons and shelled the bluff. Just when police assumed the Indians were dead, a crow overhead was shot by one of the Indians and so the shelling continued. Almighty Voice's rifle - taken from one of the civilians (probably Grundy) who attacked the bluff; his original weapon had been a muzzle-loading shot gun. The following morning, the NWMP officer from Regina, succumbed to pressure from the vigilantes and the bluff was stormed. The bodies of Almighty Voice and Little Saulteaux were discovered dead in a rifle pit, dug with half of a butcher knife tied to a pole; the body of Dublin was found nearby. Almighty Voice's wife, Spotted Calf, and his son (Stanislaus Almighty Voice?) in 1927 at his father's grave. "No.238 Beardy's Warriors (of Northwest Rebellion, Duck Lake, 1885). Duck Lake, N.W.T., July 13th. 1891." On back my photograph is a note; " ...Third from the left (sitting) is Almighty Voice,..., famed as a runner and hunter...Taken from the sixth Annual, "Scarlet and Gold" page 69." The photograph is from a collection of 13 images owned by R.C.M.P. veterinarian Ernest Joseph Camies who served during the Northwest rebellion. Almighty Voice would have been a teenager in the photo, and just a kid during the rebellion (his father did participate). That being said there seems to be some possibility that he was photographed in the group. 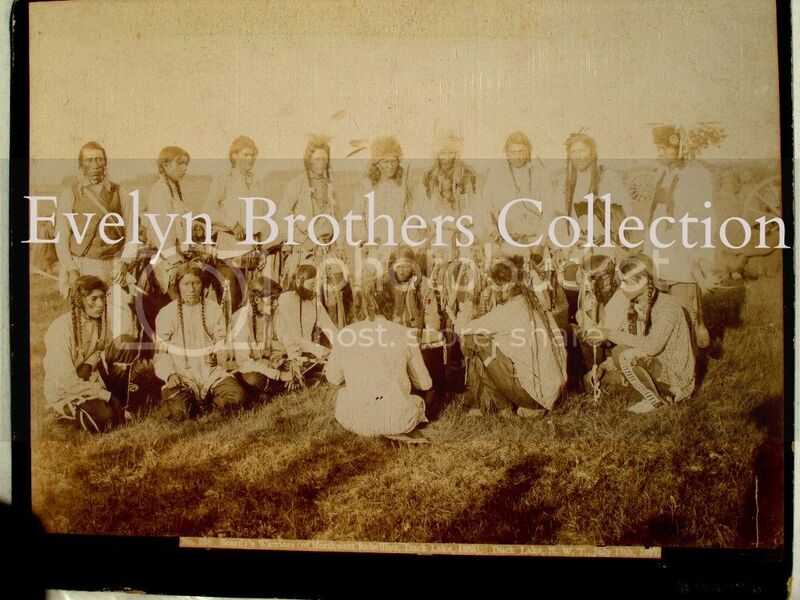 The note on the back of the photo also contains inaccuracies like "A chief of the Blood band of the Blackfeet" and "Seven men (Constables and scouts) of the N.W.M.P. were injured before Almighty Voice was slain" both are part of another legendary pursuit of "Charcoal" another character in Canadian history with a similar tragic story.The photograph had been with the Camies family until a few years ago. Please be considerate that I am not trying to insinuate a fact just wanted to pass on what I thought was an interesting detail open to discussion. Thanks for posting this, Rory. Never seen this before. thank you for starting that historical story regarding Almighty Voice, a really tragically incident in the history of Canada. The first time I read about Almighty Voice was for many years in a book by the Polish author Arkady Fiedler, >Der kleine Bison < ( The little Bison ) . A few years later, I could see the story in the movie >Alien Thunder<, the movie was broadcasted in German TV. On May 30, 1897 ( then a sunday ) after heavy gunfire including rounds from a nine-pound field gun, Almighty Voice, his brother-in-law Topean and his cousin Little Saulteaux were all found dead. „Almighty Voice had contended that the steer he had killed had belonged to his father, not the government, and by January 1896 this contention received some official substantiation. Inspector John B. Allan, one of the officers involved in the man-hunt, reported that “the feeling is gaining ground among the French Half-breeds and others to the effect that ‘Almighty Voice’ was originally arrested on the report of a child . . . and that he had committed no crime in the first instance.” Herchmer ( head of the NWMP ) commented that there appeared to be no evidence against Almighty Voice on the original charge and that they would have had to release him the morning after his arrest if he had not escaped. The turn of events, however, had carried the case far beyond the original mistaken charge and Almighty Voice was now a “bad Indian” to be tracked down“. Here's the photo claimed by his descendant Norman Paul(?) to be Almighty Voice. maybe the generally well-known photograph of Almighty Voice is a mistake, at this time, we can not be sure. Hmmm... and then I came across this photo of the recently surrendered Dakota leader, White Cap, during the Northwest Rebellion. So much for that!